This looks like a great event for everyone. The only problem for me, is that I am in England and this event is in the U.S! So if you area in the Alhambra, California area, why not take a look and have a fun day. If anyone would like to review the event for us, please drop me an email. Then we can let, all who could not attend know, what was actually missed - including me! Admission is free. All-ages event. 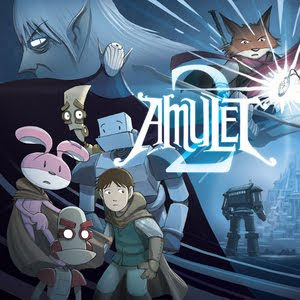 Alhambra, CA – Gallery Nucleus invites you to join us as writer, artist, and Eisner Award Nominee Kazu Kibuishi discusses the process behind the latest release in the Amulet series as well as other current projects. Hear the artist read from the latest book as well as answer questions from fans and other aspiring artists. A signing of the new book will follow. Emily and Navin's mother is still in a coma from the arachnopod's poison, and there's only one place to find help: Kanalis, the bustling, beautiful city of waterfalls. But when Em, her brother, and Miskit and the rest of the robotic crew aboard the walking house reach the city, they quickly realize that seeking help is looking for trouble, dangerous trouble. The Elf King's son, Trellis, is still after them, but this time he's accompanied by a mysterious and dangerous guard, Luger. Then an equally mysterious fox, Leon Redbeard, steps in to help. This new fox friend offers to take Em on the perilous trip up Demon's Head Mountain to find the antidote she needs. Miskit is suspicious, Navin is worried about being left behind, and Emily is in the toughest spot of all. She's got to let loose the power of the amulet—without losing herself! More about the artist and praise for his work.